Join us for a conversation with GRAMMY-winning record producer Ian Brennan about the relationship between music and social justice. 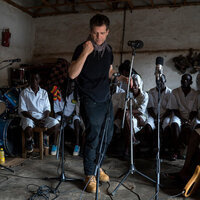 He'll discuss his experiences recording inmates of Malawi's maximum security facility, the Zomba prison, share videos and recordings, and we'll explore how, in Brennan's view, "Innovation has almost, without fail, routinely risen culturally from the bottom to the top...many of the most important artists historically have originated from less than auspicious circumstances." Ian Brennan has produced four GRAMMY-nominated records (World Music- 2011 and 2015, Best Traditional Folk- 2006 and 2007). He is also the author of four books. Most recently, he produced the Zomba Prison Project “I Have No Everything Here” (Six Degrees Records), a record which was nominated for a Grammy award in World Music. Their new followup album "I Will Not Stop Singing" was just released in September 2016. The project was featured on the front-page of the New York Times and on the television program "60 Minutes" with Anderson Cooper reporting. This past year also saw the arrival of six other albums Brennan produced, including: Khmer Rouge Survivors [Cambodia] "they will kill you, if you cry" featuring survivors of the 1970s genocide; and “Survival Songs”, the first official solo album from legendary LA-underground figure, Bob Forrest (Thelonious Monster, Celebrity Rehab). It grapples with Forrest's own cycle of addition and recovery. Brennan's fourth and latest book, How Music Dies (or Lives): Field-Recording And The Battle For Democracy In The Arts was published in February, 2016 (Allworth/Skyhorse, NYC).